I woke up feeling *really* good today... I had gone all night without pain meds- though I did very much need one when I woke up, I was really happy that I got through the night. And despite being in pain, I felt energized and motivated. So we rested for a bit (though not long since Nana got up with the boys and let us sleep in until around 8:30) and then got dressed and headed out for a typical Saturday outing... the Davis Farmers Market. It was a great day to be there... the boys got to play and I got to walk around in peace. This is a perfect time of the year for the farmers market- everything looks and tastes amazing. We even walked away with a new addition for our yard... I had mentioned how neat the leaves were of this plant and while I wasn't looking my mom bought it and surprised me with it later on <3 The boys got to plant the new plant... which of course was lots of fun for them- what boy doesn't love dirt? I was beyond ready to lay down on the couch upon our return home- and there were many occasions, while we were out, that I felt clammy and in need of a park bench... but it felt SO good to get out for a while and do something fun with my fam bam. Zachary and this other little boy LOVED that Damien and the other dad were reaching through the holes and getting them... their laughter was hysterical. 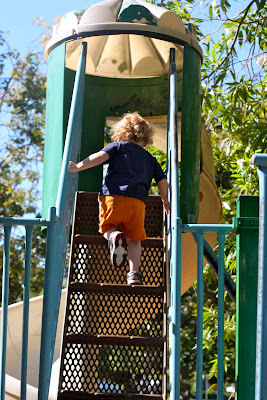 He's fearless when it comes to playground equipment... This slide is very high up and he loves it. I try to teach my children- never stand close to Nana when she has a hose... or if you do stand close, make sure to be holding on to an expensive electronic (a camera works well). So glad you got some fresh air. Yesterday danny got to the top of one of those big curvy slides and decided to try and walk down it...yeah that didn't go so well for him, now he has a big bruise on his face...when do little boys start to realize they are not invincible? He ended up sliding down face first, quickly got tobhis feet and went back to do it again. We promptly stuck him in a baby swing kicking and screaming.